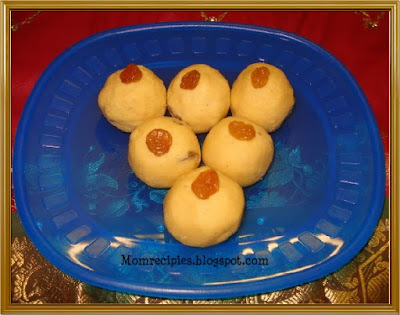 I make these Daliya laddus very frequently when I wanted something sweet and had little time on hand.They are very simple to make and yummylicious to taste. Grind the roasted split gram into a fine powder in a mixie and sieve it. Powder the sugar in mixie and keep aside or use powdered sugar. In a pan, heat 1 tsp ghee and add Raisins and fry for some time until raisins puff and keep aside. In a big bowl mix well roasted split gram powder ,powdered sugar ,cardamom powder ,nutmeg powder and puffed raisins. Melt ghee and pour into the prepared mixture and mix well using a spoon . 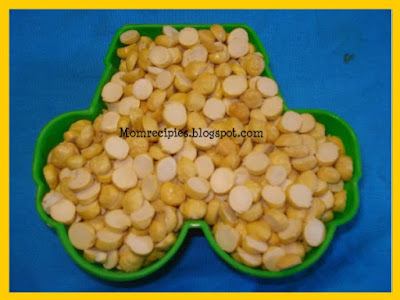 When the mixture is still warm grease your palm with ghee and start making small balls with the mixture. Leave the laddus on a plate to dry and store in an airtight container. They can be stored in an airtight container for about 15 days. Note : If it's difficult to make rounds, you can add some melted ghee, if needed.